While upgrading device software to the latest firmware version available is highly recommended for performance and functionality enhancement, update errors are inevitable especially when using iTunes. So what would you do if in case you to will encounter an error while attempting to upgrade your iOS device software via iTunes? First thing you need to do is to take note of the error code or alert message you encounter. And second, I encourage you to read on this content to find out what to do next. This article contains recommended methods to fix errors when updating iOS firmware on your iPhone, iPad, or iPod touch via iTunes. Among the common reasons as to why you encounter these errors is because you computer is currently running on an older software version or is unable to connect to the server. Now there are a few steps on how you can fix most of these software update errors and restore software on your iOS device. We'll start with the basic resolution steps. 1. Be sure to update iTunes. Getting the latest version of iTunes on your computer is highly advised to avoid any issues when performing software updates. 2. Update your operating system. It is also important to update your computer's operating system (Windows or Mac). If you still haven't updated your OS, you can get available updates from Mac, or check out Microsoft website if you're using a PC. 3. Verify your computer's security software and check the settings to ensure it's not causing an issue. You may disable any security software and re-attempt to perform a software update. If the error persists, then it's not causing the problem. Proceed to step 4. 4. Unplug any other USB devices. To ensure there's no conflict, we recommend you should keep only your iOS device, keyboard and mouse plugged in directly to your computer. Remove other USB-attached accessories from your computer to make sure they are not the ones triggering an error to occur when performing the iOS update. 5. Restart your computer. Sometimes a simple restart can fix certain application errors on a device. So try to turn off both your computer and iOS device, then turn them back on and retry iOS software update on your device. "The [device name] iPhone, iPad, or iPod touch could not be restored." "An unknown error occurred [error code]." Again, be sure to take note of the error message or error code that prompts when attempting to perform software update on your iOS device. If you already got the error code, then you may refer to the following resolution steps. A. Errors: "There was a problem downloading the software," "Device isn't eligible for the requested build," and error codes: 17, 1004, 1013, 1638, 3014, 3194, 3000, 3002, 3004, 3013, 3014, 3015, 3194, 3200. These errors are often associated with network or connection problems on the device. These error alerts or codes denote that your computer is either unable to communicate with Apple's update server or unable to communicate with your iOS device for upgrade. We therefore suggest you should check your computer for software settings that might cause such communication/connection problems between your computer and Apple update server or between your computer and your device. B. Errors codes: 2, 4, 6, 9, 1000, 1611, 9006. These error codes have something to do with a security software that is preventing your computer from communicating with either your iOS device or the Apple update server. In this case, we recommend checking of your security software settings and ensure they are not blocking the connection between your computer and the Apple update servers and/or your iOS device. C. Error codes: 13, 14, 1600, 1601, 1602, 1603, 1604, 1611, 1643-1650, 2000, 2001, 2002, 2005, 2006, 2009, 4005, 4013, 4014; Error message: "Invalid response." This errors are often tied to USB connections, specifically when the USB connection between your computer and your iOS device is interrupted, thus preventing you from updating or restore iOS software on your device. 1. Be sure to use only the USB cable that came along with your device or other Apple USB cable. 2. Try to plug your cable into a different USB port/slot directly on your computer. 3. Try to use a different computer (if available). If you don't encounter an error using a different computer, then it simply means the problem is due to your original computer. 4. Check the USB connections between your device and your computer. 5. If you are using virtualization applications, like VMWare or Parallels, try to close them for now. These apps may interfere the connection between both devices via USB especially if they are not configured properly or not updated. If the problem is fixed by doing so, then we suggest you contacting the developer of the app for updates. Your device unexpectedly disconnects from the computer during syncing. If the error message still prompts, then proceed with checking for hardware issues, as follow. D. Error codes: 1, 3, 10, 11, 12, 13, 14, 16, 20, 21, 23, 26, 27, 28, 29, 34, 35, 36, 37, 40, 1000, 1002, 1004, 1011, 1012, 1014, 1667, or 1669. These error codes indicate that your iOS device or your computer may have encountered a hardware issue, which is preventing the update or restore from completing. 1. Verify your security software settings and ensure they are not preventing your iOS device from communicating with the Apple update server. 2. Try restoring your iOS device twice while connected with a cable, computer and network that are working properly. To restore your iOS device, you can use iTunes. Doing so will reset it to factory settings and the latest iOS version. But remember that restoring iOS software also removes all your data and contents from your device like songs, videos, contacts, calendar info and photos. That's why it is highly recommended to back up your device first, using iTunes and transfer/sync any additional contents to your computer. Also don't forget to turn off Find My iPhone feature. To do so, go to Settings on your iOS device, and select iCloud to disable Activation Lock. 3. Verify your security software and settings are allowing communication between your iOS device and update servers. 4. If you still see the error prompt, then it's time to contact Apple support and escalate the issue you have while attempting to get the latest build for your iOS device. E. Error code: 1015; error message: "The required resource cannot be found." This error has something to do with an outdated or modified software used on either your computer or iOS device. So, check both your computer and iOS device for any possible invalid/erroneous software modification or outdated software. Other error prompts you may encounter during iOS software update via iTunes include, "Your device has a beta version of iOS," "You're trying to install an earlier version of iOS or downgrading," and "Your device has unauthorized modification to iOS or jailbreaking." If the problem remains after performing all the aforesaid workarounds, then restore your iOS device using iTunes. Also, it might be necessary for you to use recovery mode to restore your device, especially if iTunes doesn't recognize your device or says it is in recovery mode, when Apple logo onscreen displays for several minutes without progress bar or when you are prompted with the Connect to iTunes screen. The progress bar show installation progress. The amount of time it takes to complete varies on the number of files on the device as well as on the process duration like when you're updating, erasing or upgrading your iOS. The more data or the larger number of files your device contains, the longer it takes for the progress bar to complete. This means you have to wait. 2. With your device powered off, plug in its USB cable to a computer with iTunes. 3. Now hold down the Home button on your iOS device, as you connect the USB cable. Keep holding down the Home button until the Connect to iTunes screen displays. [please refer to the following image]. 4. When this screen shows up, release the Home button. If you don't see it, then repeat steps 1 to 3 until the screen appears. 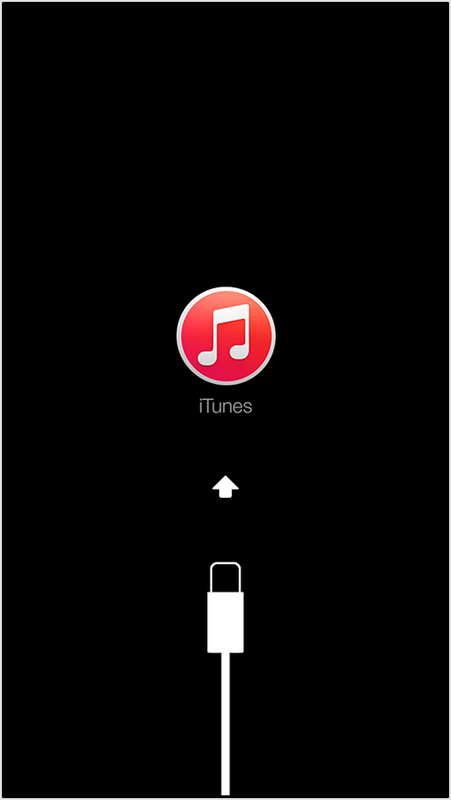 iTunes will then open once your device is connected. You will know when your iOS device is connected with you are prompted with a message saying that iTunes has detected your device (iPhone, iPad or iPod touch) in recovery mode. Click OK to continue. Restoring in recovery mode will then erase your device. There have been a number of iOS device owners complaining about certain errors they encountered while attempting to update to the latest iOS version 8.0. If you too are having the same concern, then you can try any of the aforesaid methods on your end.